It’s not that hard, right? You just open your mouth, close your eyes, and throw it back. At least that’s how a lot of people eat oysters. I wonder if they really like them, or just the idea of eating them? I consider myself something of an oysterholic. There’s only so long I can go without eating some. I like them just about every way you can prepare them, but especially raw. I have several friends who are also oysterholics. Since our problem is more than we can handle, we’ve developed a twelve-step-program. Thank goodness they sell oysters by the dozen! I remember the first oyster I ever tried. It was spring break of my freshman year in college. I visited a friend who lived on a boat along the Florida coast. We were broke and hungry so he showed me how to wade out and catch oysters from the Apalachicola Bay. We shucked them with a screwdriver and ate them on the spot. They were delicious. I’ve since refined my techniques for finding and eating oysters, but I’ll never forget the first time. 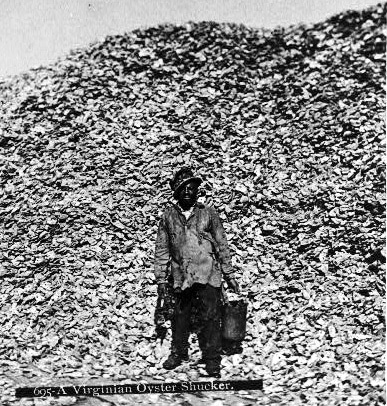 In times past, the Chesapeake Bay was famous for its oysters. In fact, in the Algonquin language, the word Chesapeake can be translated, great shellfish bay. 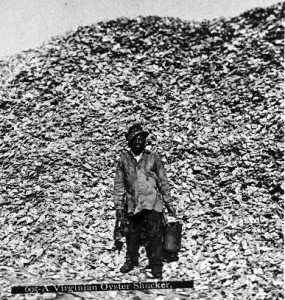 The scientific name for Atlantic coast oysters is Crassostrea Virginica – Virginia for the Chesapeake Bay state where they were once so plentiful. Unfortunately, Chesapeake oysters are nearly gone. A recent survey by the University of Maryland found that our state currently has three-tenths of one percent of its original stocks of 150 years ago. Despite their near depletion, wild oysters are still harvested here. That’s one of the reasons why our water quality is so poor. One adult oyster can filter as much as 50 gallons of Chesapeake Bay water a day. No oysters = no filtration = dirty water. The lack of wild Chesapeake oysters has driven some commercial harvesters to criminal activity such as raiding protected sanctuaries and keeping oysters that are way too small. Oyster poaching is a growing concern for the Bay. Considering their problems, I don’t know why people eat wild-caught Chesapeake Bay oysters. It’s obvious that buying and selling wild caught Chesapeakes is bad for the Bay. I discourage anyone from going to restaurants or seafood shops that sell them. It’s worthwhile to ask, “are your Chesapeake oysters farm raised or wild caught?” If they’re wild caught, order something else. 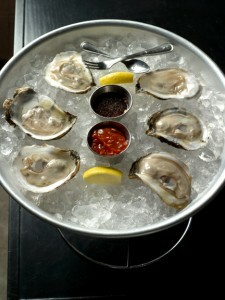 Take it from an oysterholic, wild-caught Chesapeakes don’t come close to the taste and quality of farm raised oysters. Fortunately, there are some oyster farmers here in Maryland who are turning out top-notch oysters. Not only do they taste better, but farm raised oysters are more uniform in appearance. They’re easier to shuck, and more plump when they’re opened. This time of year, they are absolutely delicious. Speaking of good taste, it’s worthwhile to take a look at where some of the best oysters in the world are coming from these days. We are fortunate to live in a region that has access to great seafood. Maryland may have some catching up to do when it comes to oyster aquaculture, but we don’t have to look far to find some of the best farm-raised oysters in the world. You’ve probably heard the old adage that you should only eat raw oysters in months with the letter R in their names. September through April are the coldest months of the year, so traditional thinking is that oysters grow less bacteria and are safer to eat in the winter. Additionally, cold water oysters are plumper and tastier because they store more fat and sugar in preparation for their summer spawn. Many people disregard the letter R rule now that modern harvesting and refrigeration techniques make bacterial contamination less likely, but it’s still a good idea to look for oysters that come from cold water. Bacteria grows faster where it’s warm, so I stay away from summertime oysters that filter water that is over 60 degrees Fahrenheit. That doesn’t mean all is l ost in the warm weather months. During the summer, oysterholics look north — way north, to places like Nova Scotia, Prince Edward Island, and other cold-climate North Atlantic locations. Oyster aquaculture is very advanced in this part of the world. They’ve refined the art of oyster farming over many decades, and they practice advanced techniques like adding algae and kelp to enhance the flavor, or moving trays of oysters to different water conditions for added nutrients. Oysters take on the taste of the water they filter, so trace minerals, salinity, and varying chemical compositions can significantly alter their taste. Flavors also change with weather conditions because algae blooms and other factors cause different nutrients to flow over the meat. Just as a whisky drinker appreciates unique flavors in Scotch, or the wine connoisseur savors the many subtleties in grapes, oysterholics recognize the various nuances of flavor in their bivalves and classify them with terms such as buttery, creamy, melony, clean, crisp, nutty, salty, and others. Farm raised oysters almost always take the name of the place where they are grown. It’s usually the name of a creek, river, or bay. Wild caught oysters have more generic and regional names, or they go by the name of the family that catches them. It’s usually not too hard to figure out where an oyster comes from just by reading the menu. I usually work my way down the coast, starting in summer with raw oysters from Cape Breton and Prince Edward Island. By October and November, I’ve slurped my way down to Maine, Massachusetts, and Rhode Island. December is a great time for Long Island Blue Points. January and February are the best months for farm raised Chesapeake Bay oysters and it’s hard to beat a long, salty Chincoteague oyster in March or April. For variety, I look for Apalachicola Bay oysters in the dead of winter, and oysters from the North Pacific in warmer months. I have a few pet peeves about how oysters are served. First of all, the best way to eat them is to get them from a trusted oyster farmer or seafood dealer and shuck them yourself. That’s a little too tedious for most people, so fortunately there are some great restaurants in our area with chefs who know their oysters. Always ask what varieties are available and order by name. If you walk up and say, “a dozen raw, whatever you got,” you just let your server know that you don’t have a clue, and you’ll probably get the cheapest and plainest-tasting oysters they have available. Ask what variety they are serving that is especially good right now. When your oysters arrive, they should be cold, preferably on crushed ice. If you ordered more than one variety, the waiter should point out to you which ones come from where. The oysters should look relatively plump and be surrounded by their own juice in the original cupped-section of the half shell. If they are dry and flat, or there are lots of pieces of broken shell mixed in with the meat, send them back. It’s common practice in this country to separate the bottom adductor muscle from the shell. In Europe, they sometimes leave them on because it generally proves freshness. 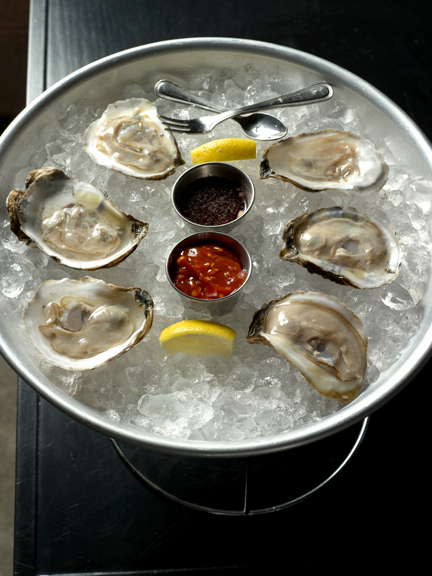 There’s no right or wrong way to eat them, but oysterholics usually don’t put a lot of condiments on the meat. I like a little bit of lemon juice and some black pepper, maybe a dab of horseradish or Crystal hot sauce if the oyster is bland. Just because they give you a little cocktail fork with oysters on the half shell doesn’t mean you have to use it. Raw oysters are way better when they’re slurped. The mission is to get all the oyster and it’s liquor in your mouth with one gulp. You might have to use your tongue. That’s part of the fun. Then, chew it and savor the taste. Beginning oyster eaters might swallow them with one gulp, or slap them on a cracker, but the holistic approach is to savor all the flavors and textures of the whole oyster in your mouth. I hope you’re enjoying this winter’s oyster bounty. This year’s farm-raised Chesapeakes are better than they’ve ever been. Look for them at the better seafood shops and restaurants. 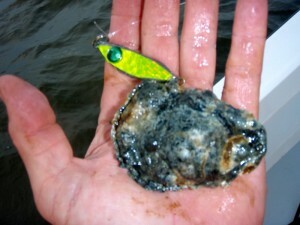 People who know oysters know better than to eat the last wild-caught oyster from the Chesapeake Bay. Now all this oyster talk has me jonesing for another oysterholistic fix. I hear there’s a twelve-step program that meets right down the street! Are there any oysterholics out there who want to join me? 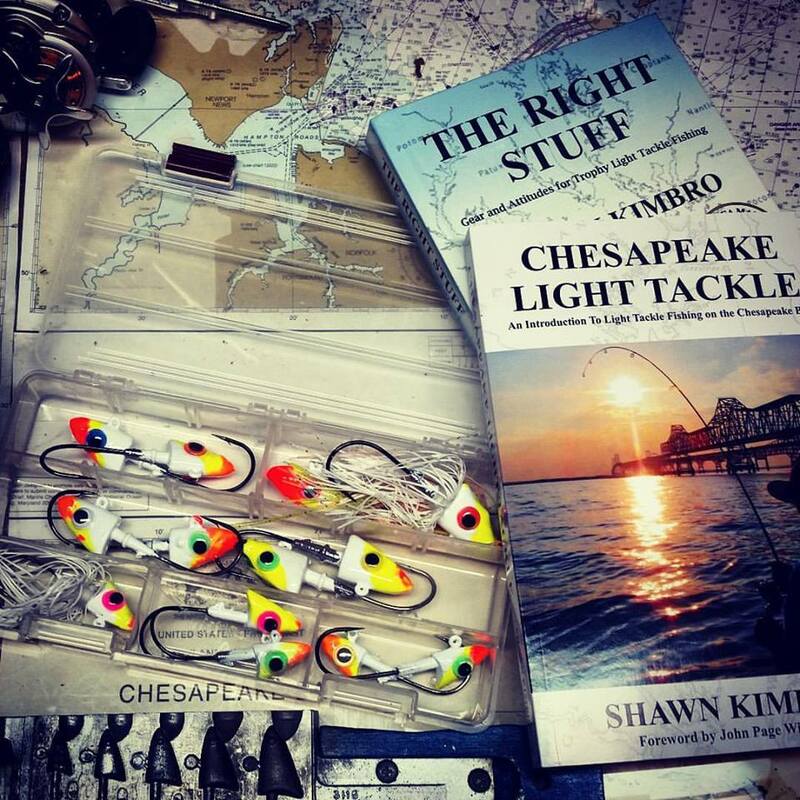 Chesapeake winter fishing is slow so far this year due to warmer than usual water temperatures. I’ve fished a couple of times over the past week and found a few fish at the Bay Bridge and a few in the warm water discharges. Nothing to brag about really anywhere. The highlight of the week was popping in on small fish breaking on the surface south of Poplar Island. 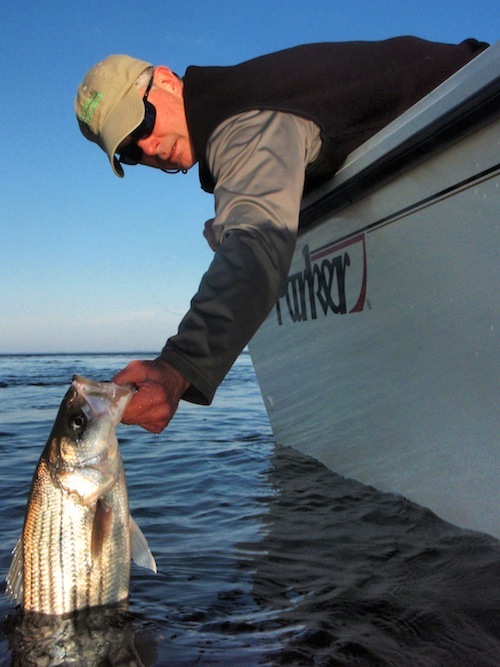 When was the last time you heard of breaking rockfish in late January? Yellow perch fishing is picking up some in the upper Bay, but nothing like it was last year at this time. Pickerel fishing in the tributary rivers and creeks is good with the best fish coming near points and dark bottoms. Shawn great read!!! Got a friend[neighbor] you gottta meet. He builds,sells,and repairs guitars banjos pretty much anything. His house is decked out contry western. Would love for you to see it one day when you are over this way. My name is Jim and I’m an oysterholic. I now see that I need to take a more oysterholistic approach to fighting my addiction. I found this article while doing a web search for farm raised oysters. In my opinion a Chesapeake Bay oyster moratorium is way overdue. While I doubt we’re in danger of eating the last one in this year or the next, there’s no doubt that stocks are severely depleted. If history tells us anything, it’s that they will be gone before anyone steps in to stop over-harvest. Many commercial fishermen are already turning to aquaculture out of necessity. Soon, the only alternative will be poaching in the sanctuaries. There just isn’t enough shells there now to support the many license holders in the commercial fleet. As a native Marylander who has fished here for over 40 years, I never thought I’d say that. Thank you for sharing some very good information in this article. Choptank Sweets are perhaps the finest farmed oyster you can enjoy from the Bay. Whole Foods in Annapolis sells them for .99 a piece (I’m a shuck ‘yer own guy, too, Shawn), and they are also available at the Boatyard Bar & Grill (usually for a buck-a-shuck at Angler’s Night Out events). Forgot to answer your question. Hinge. Never learned to side-shuck ’em. 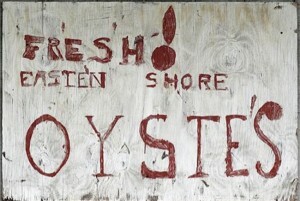 here is an excellent article on the state of the oyster fishery in the Chesapeake. Hey Shawn, I clicked on the photos of mermaids and an oyster menu came up. Can you tell us where that is from? Ha ha… there’s another hidden link up there as well. 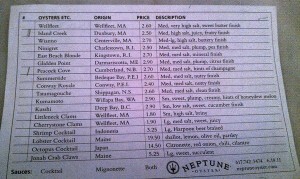 You found today’s oyster menu at Old Ebbitt Grill in Washington DC. OEG has top-notch oysters flown in daily from the best farms on the East Coast. Better yet, their Happy Hour starts at 3:00 PM when they’re half price. 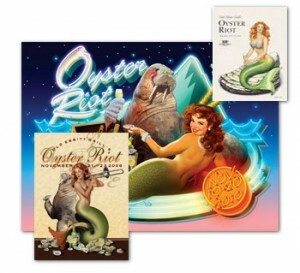 Their annual Oyster Riot is internationally famous. I also second Gary’s recommendation for Annapolis’s Boatyard Bar & Grill’s farm raised oysters and I’m glad to hear that Whole Foods has Choptank Sweets (Mmmmm). Jim, Jimmy, and Bill, thanks very much for the comments and great observations. Bob & Uncle Phill, thanks for the links. Very good information. Ah, got it now. Thanks. Oh, I found the other link too. Sounds good but doesn’t Harrison’s serve wild-caught oysters? My understanding is that they always have, but I don’t know what they’re doing now. I’m certainly not promoting the company. 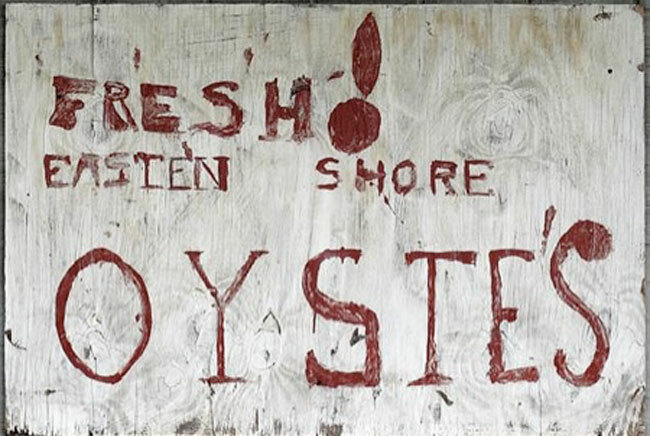 They’re just a longstanding eastern shore oystering business that I used as an example. Thanks, Joy. I’m getting around to answering your lure making questions….. so many words, so little time! Oh, by the way, I see a fish was caught. You boys crack me up. I’m an oysterholic, too, and I’m in! jonesing for a 24 step fix! I’m with you, Shawn…all year long…as long as the water was cold where they came from. Who else do you know jigs up oysters on a homemade lure? Apalachicola oysters are a sure bet this time of year. Good for losing weight too. I heard Kimbro can jig up two, three bushels a day. I think I might just have to get a few today for dinner with the family tonight. See if my wife will whip ip some of her “nectar of the Gods” Rockefeller mix. Yum, Yum. 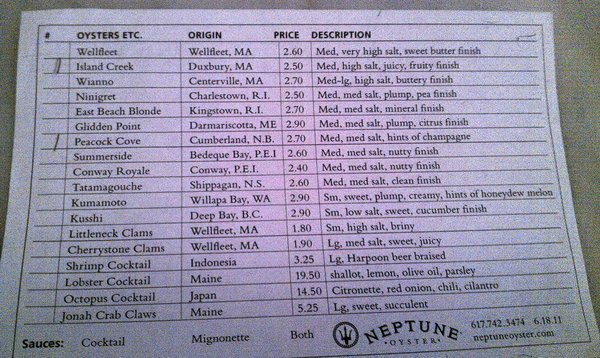 One place you did not mention in your “where to get oysters list” was Cape Cod, especially the town where I spend a lot of time in the Spring, Summer, and Fall, Wellfleet Mass. It is an amazing sight to see when the tide goes out, and then all of the aquaculture structures, come out, then all the shellfishermen appear to work their grants on the flats. Our winter caretaker for our house has a grant. I call him to order oysters and clams (usually 4 doz clams and 3 doz oysters). He leaves the just plucked from the salt oysters in a cooler in his back yard. Oh, and with a jar to leave the $$. I second the nomination for Wellfleets. Shawn mentioned Old Ebbitt Grill, so I bet he’s had them there. Shawn, I’m surprised we haven’t run into each other. You’re right, Fletch, big oversight to leave off Wellfleets. Crisp, clean finish and high on the salty scale. Would love to spend more time at the Cape. Carol, I don’t go to OEG too much. Usually it’s a very late lunch right as Happy Hour starts. I like the corner bar. What a great post! Unbelievable that wild caught oysters are still served in Maryland. We had some on Valentine’s Day here in Romancoke at Kentmoor. I am officially going to feed my own oysterholism by being more vigilant about where they are from and whether they are farm-raised or not! Thanks for the comments and the increased vigilance, Amanda. A lot of people really like Choptank Sweets. They’re farm-raised, sweet, plump and delicious in addition to being about as local as we can get. Also, most Chincoteague oysters are farm-raised now. Yumm!